Periapsis Music and Dance is a unique company and the only organization of its kind that I can think of, serving both as a creative laboratory and outlet for dancers and musicians. The company retains an ensemble of six dancers and six musicians, and creates work by both resident artists and commissioned guests. Artistic Director Jonathan Howard Katz is interested in developing collaborations with choreographers and dancers in which the music is equal to the movement in importance and intricacy. 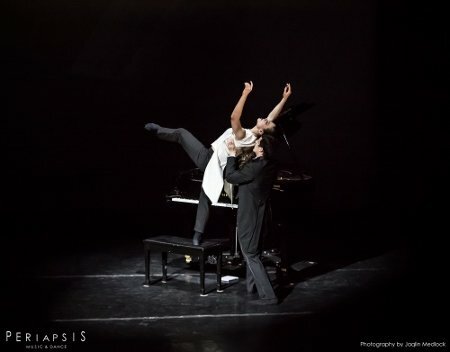 The Portrait Project, a unique and fascinating concept in which six different choreographers present new works for solo dancers and solo musicians, is an output of that artistic mission. Escape Velocity, choreographed by Sean Curran, is set to various percussion instruments – bowls, drums, wooden chimes – composed and played by Sarah Mullins. Dancer Erin Dillon embodies the quirky intricacies of Curran’s choreography beautifully, at times sinuous and fluid, at others percussive and staccato. Each duet incorporates the musician into the piece in different and interesting ways. In some there is actual physical contact, in others just an energetic connection. In Escape Velocity, sometimes Dillon’s movements mimic or echo the movements of Mullins while she is playing, her hand circling around her other wrist, for example, the same way Mullins’ hand circles the music bowl as it makes sounds. Trust, choreographed by Miro Magloire to music by Richard Carrick, explores the limits of just how much the musician can be incorporated into the choreography, and involves the most dramatic physical contact of all the duets. Interspersed with ‘rest’ periods of beautiful classical dancing by Elisabeth Jeffrey, and lovely, stationary violin playing by Lauren Cauley, are moments of extreme contact. Cauley sits on Jeffrey’s back as she crawls across the stage. She continues to play flawlessly as Jeffrey pushes her, rolls her across her body, walks with her, and as she supports Jeffrey in suspended balances. It was a gorgeous piece of moving architecture that was made all the more impressive by Cauley’s continued playing. In Reflection by Katarzyna Skarpetowska, musician Jonathan Howard Katz interacts with dancer Michaela Catherine McGowan and also has simple movement phrases of his own. Dancer and musician seamlessly switch roles and use the bench and each other as supports. McGowan is an intense and magnetic dancer. Technically strong and expressive, my eye is drawn to her over and over, even amidst the full cast of superb dancers in an excerpt from Latency, choreographed by company members Erin Dillon and Hannah Weber. Conversational and sculptural, the musicians and dancers positioned on stage in interesting ways, Latency builds solos into duets as other dancers watch, movements and pairings emerging effortlessly from stillness. Manuel Vignoulle’s Twine is also conversational and sculptural in nature. With music by Katz, performed on viola by Celia Hatton, the piece opens with dancer Megan Jones coiling and twining around and through Hatton’s legs as she plays, like a snake or a blade of tall windswept grass. Like the other pieces on the program, yet completely unique to Vignoulle’s vision, Twine plays with the music, speaks to it, in lush suspensions and ultra quick, cat-like movements. The fluid quality of both the music and the dance is especially pleasing, the quarter notes in the music mirroring the aquiline choreography. In this conversation, Hatton is sometimes leading Jones, and sometimes Jones is provoking or enticing her. 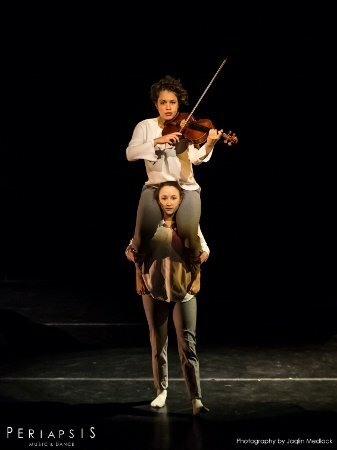 As Hatton walks around the stage and plays her viola, Jones entwines with and manipulates her, using her as a support, at one point climbing to sit on her shoulders. Vignoulle’s choreography has a very visceral, primal and animalistic feel to it, deeply pleasing to watch, and his musicality is easy and natural. The final image of the piece, Hatton walking on the downstage diagonal, Jones crab-walking behind her, pushing her legs with her feet, was an image that hasn’t left my mind. I look forward to seeing much more from this innovative company of talented dancers and musicians, and more collaboration with different choreographers. Katz has a distinct and fascinating vision, and one that I think is very important and exciting in the NYC dance community.